Medical carts for any use that integrate electronic devices need a portable power unit. Since the flow of data or medication is an integral part of a medical procedure, it is imperative that the systems connected to the carts power source will function uninterrupted. 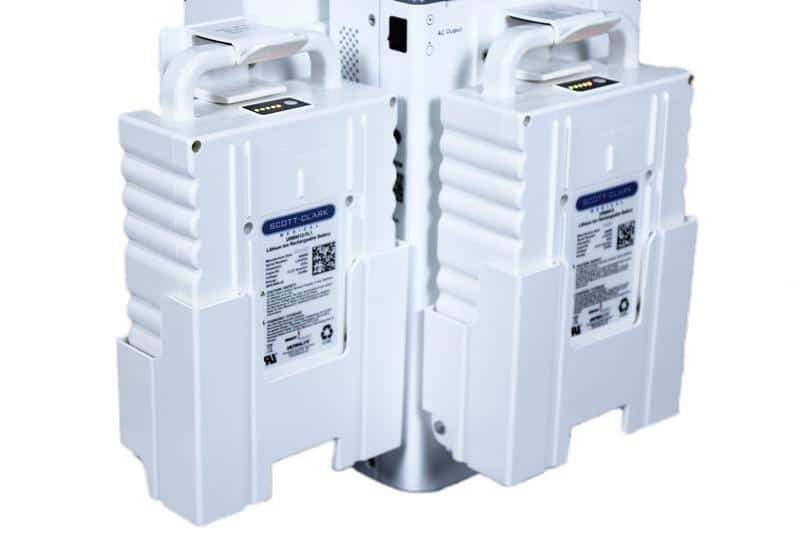 Scott-Clark has developed the industry’s leading hot swap battery unit, which is a modular unit that allows you to swap a depleted battery pack with a fully charged one in one single motion and does not disrupt the connected devices operation. The design of a successful hot swap battery system was first implemented in 2001 in Pennsylvania, and the concept was simple and ingenious. Two battery packs were assembled in the power unit. One pack was operational while the secondary pack was kept in place when the first one ran out of power. The moment the first power cell is depleted, the second pack is automatically initiated, and a warning light alerts the staff. The staff now have a few hours in which to replace or recharge the depleted cell. FMCPT is the leading hot swap battery solution that provides you with both a longer lasting power source, a flexible recharging option, and the longest lasting power packs, that provide you with hours of energy that meets all shift requirements. Scott-Clark provides reliable cart power and battery management systems, point of care medication workstations, and offers a patented Flexible Mobile Cart Power Technology System.